Austin, Texas to Bastrop, Texas — in a canoe. At the starting line at 5:00 AM. 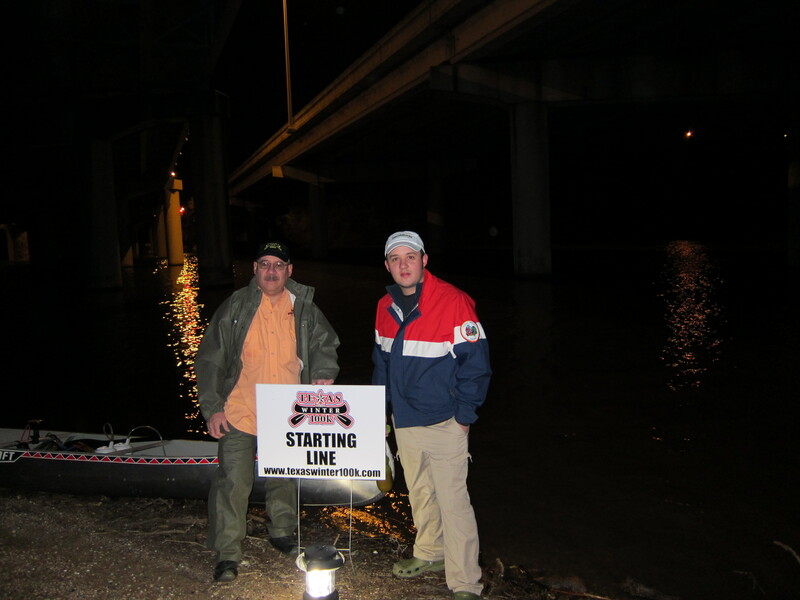 My son Jonathan and I successfully completed the Texas Winter 100k canoe race yesterday. This race begins at Town Lake in Austin, Texas and winds its way down the scenic Colorado River to the finish line in Bastrop, Texas. Jonathan and I left the starting line at 5:00 AM and crossed the finish line at 6:29 PM. We finished 13th out of 27 in the Adventure Class and 7th out of 14 in the Adventure Tandem Class. That’s not too bad considering this is only my third marathon canoe race and my personal goal was to cross the finish line alive, or at least reasonably so. In this case, I would say that I finished reasonably alive. Although shorter in distance, this race was a little harder for me than the previous Colorado River 100 mile canoe race last September. That’s because I have been out of the country so much that I have not had much of an opportunity to do shorter training runs with Jonathan. So, after a few hours into the race I discovered that I am ambidextrous — it was as equally painful to paddle on the right as it was to paddle on the left. But thankfully, Jonathan was very patient with me and we had a great time doing this race together. I am just glad that we finished within the allotted time. This race was just one more step along the way to the Texas Water Safari in June, billed as the world’s toughest canoe race. I know that if I am going to survive that 260-mile race then I need to do more training runs with Jonathan. And I intend to do just that. Although my international travel schedule is a little crazy, I have to make the time to get in better shape for the big race. Thankfully, Jonathan already has our training schedule mapped out. As I reflect on the Texas Winter 100k, I thought about the best and the worst about the race. So, here are my picks and pans. Best: Spending 13.5 hours in a canoe with my son. Worst: Spending only about a half hour out of the canoe to stretch my 55-year-old body. Best: Meeting some really nice folks along the race route. Worst: Not having more time to chat. Best: The flow of the river was a bit faster due to recent rains. Worst: Several miles of paddling into strong winds. Best: Beautiful vistas along the way. Worst: Litter and debris in the river. Best: Some great-tasting energy gels and snacks. Worst: Spiz endurance drink. Delicious stuff but my body reacts poorly to it. Best: Signing up for a drawing for a free paddle. Worst: Missing the drawing because we were told it was at 8:00 PM. Both our names were drawn about half an hour earlier while we were loading our canoe and gear. Bummer! Best: This was a much-needed training run for me. Worst: The realization that I have lots of work to do to get ready for the Texas Water Safari. 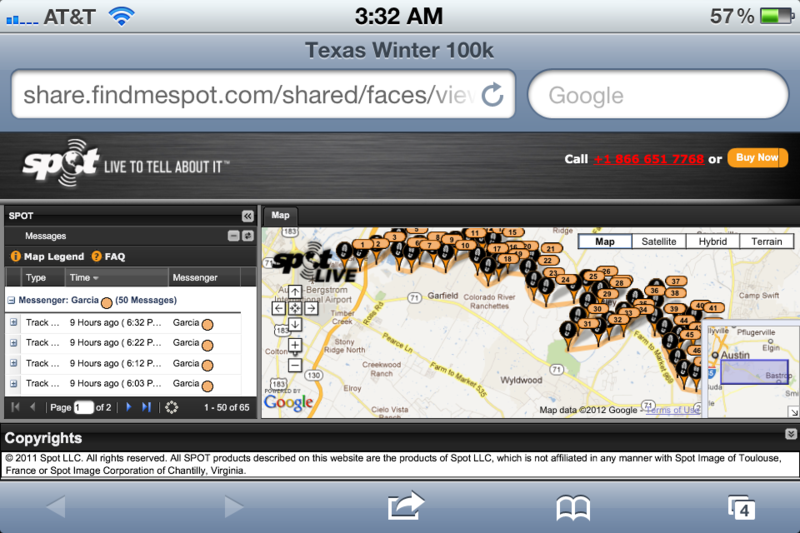 The race route as recorded by our Spot Tracker. Congratulations!!!!! You are awesome to even attempt to do this challenging journey. It is obvious that God is on your side!!! You are driven and it is because of our Lord Jesus Christ that you are. God Bless You for everything you do. You are such an inspirational fellow (fella’ in Southern talk)? Thanks for your encouraging and kind words, Marilyn. So glad that this race is over. Now to get ready for the next one! CONGRATULATIONS Omar and Jonathan! This is unbelievable! When I was much younger, I completed a few endurance events. However, these canoe races seem to be just shy of the Tour de France! Omar, just like you do things in the rest of your life, you will “walk (canoe) with a purpose” and you and Jonathan will finish the Texas Safari in great fashion. Thanks so much for your encouraging words, Jeff. Omar, you never cease to amaze me. You manage to cram several lifetimes of activity into the one lifetime allotted to you here. God must be so proud of you! Thanks, Lanni. It’s nice to have finished this latest race. I know I have lots to do to get ready for the big race in June.